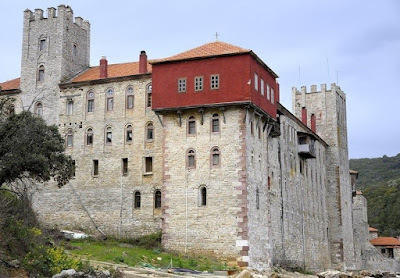 The Holy Monastery Esphigmenou of the Holy Mountain is one of the twenty preponderant patriarchal and stavropegic Sacred Monasteries that comprise the monastic community of the Holy Mountain of Athos, under the spiritual supervision of His All Holiness the Ecumenical Patriarch Bartholomew. It is in full communion with all the Hagiorite Monasteries, Sketes, Cells etc, as well as with the Ecumenical Patriarchate of Constantinople, of which the Holy Mountain is a canonical territory, and with every other canonical, local Orthodox Church. After a period that spanned between 1974-2005, the Sacred Monastery of Esphigmenou returned to Its full canonical status and ecclesiastic communion, given that the Sacred Community of the Holy Mountain - with the participation of the Ecumenical Patriarchate of Constantinople – had appointed, in accordance with the Hagiorite institutions, a new monastic brotherhood under the guidance of the reposed abbot Archimandrite Chrysostom (Katsoulieris). The new brotherhood of the Monastery had thereafter assumed in full the duties, the obligations and the rights of the Sacred Monastery of Esphigmenou, towards all. The present abbot of the Esphigmenou Monastery is Archimandrite Bartholomew (Gazetas), while Its brotherhood is comprised of 23 monks. To this day, the Holy Esphigmenou Monastery has been unduly confronting issues pertaining to the inexcusable unresponsiveness of government personnel as regards the execution of the decisions reached by the Ecumenical Patriarchate, the Sacred Community of the Holy Mountain and the Greek Justice– an unresponsiveness that is totally unjustified and detrimental for a State that is under the rule of law. Issues, such as: the continuing occupation of the central building complex of the Monastery (situated at the north of the Athonite peninsula) and the illegal withholding of the Monastery’s portable and immobile heirloom treasures, Its sacred Icons, Its precious relics, Its architectural heritage; in general, Its cultural inheritance, Its library and the Monastery archives; also, the persistent withholding and hoarding of Its important assets, which are being squandered to Its detriment; the desecration by schismatics of all the things sacred and holy for the Monastery (the central church – Catholicon, the chapels, the Holy Altars etc. ), as well as the artfully cultivated confounding of the Christ-named flock through the mass media on the matter of the Monastery, Its name, Its representatives etc. Serious issues have arisen and continue to arise because of this inexcusable negligence by the government authorities, who, by “focusing on the tree, have missed the forest” and have abandoned a part of the Holy Mountain – which is institutionally under their direct jurisdiction – thus rendering It unprotected, unguarded, untidy, and easy prey to self interests and expediencies. The Esphigmenou brotherhood under the Archimandrite Bartholomew – which has been recognized by every ecclesiastic and civil authority – hereby clarifies that, on account of the aforementioned problems, it still does not reside inside the Monastery’s central building complex, but instead, in the representatives’ quarters (the “konaki”) of the Sacred Esphigmenou Monastery situated in Karyes – the Holy Mountain’s capital. The persons residing in the central building complex of the Monastery are not Hagiorites or Esphigmenites; unfortunately, they are only appropriators and schismatics, who are pending official expulsion from the Holy Mountain; in fact, some of them have also been convicted by the Greek Justice for assorted offences of a criminal nature. To avoid spiritual harm - and generally speaking it is for one’s own benefit - that every well-meaning person abstain from any kind of ecclesiastic association with these appropriators, as well as from any kind of financial exchange with them, in order to avoid becoming involved in criminal offenses (for example, illegal use of VAT exemption documents). To personally safeguard themselves, we humbly regard that every well-meaning person when coming in contact with the self-styled “Esphigmenite monks” should appropriately investigate and determine whether the latter are indeed canonical Hagiorites and Esphigmenite monks, and are not destined for official expulsion, or if they are schismatics or convicted individuals. Finally, the canonical brotherhood bears no responsibility for possible spiritual harms or other damages that may arise on account of relations or exchanges with appropriators of our Sacred Monastery’s buildings. The Holy Monastery Esphigmenou continues on Its course, fully aware of Its mission and Its long history and tradition, with total respect to the customs and the traditions of the Sacred Garden of our Lady Theotokos, while continuing to strive for the full implementation of legality within the Holy Mountain in regard to Its specific case, and for the dissolution of irresponsible rumors surrounding Its name. It furthermore extends Its steadfast invitation to those near and far, to collaborate within the cadre of ecclesiastic canonicity and civil legitimacy, while always awaiting with abundant love and prayers the revival and the return of the misled, appropriator brothers who are in a state of schism and illegality, and stating one more time - as the only legal and recognized authority - that It will do everything It can for their full re-incorporation into the Hagiorite community.